Have you recently experienced that tickle in your nose or dryness in your eyes? These late summer months are the typical start of weed pollination, so get ready to welcome your not-so-best-friend: fall allergies! Although ragweed pollen is the most contributing factor to fall allergies, outdoor molds can also be a culprit; they are common in soil, compost piles, and in the leaves that cover the ground in autumn. Limit your outdoor activity on windy days. Ragweed produces a large amount of pollen, often in the morning hours, and releases it into the wind. 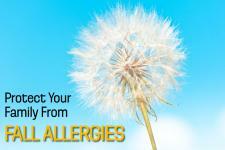 Remove pollen and outdoor mold spores from your skin and hair on a daily basis. Close your windows and turn on your air conditioner. While you may be tempted to open up the windows when that first cool breeze comes, you should refrain in order to keep your home free of pollen and mold. Dry laundry in the dryer. Hanging clothes outside will only allow for pollen and ragweed to settle on them.